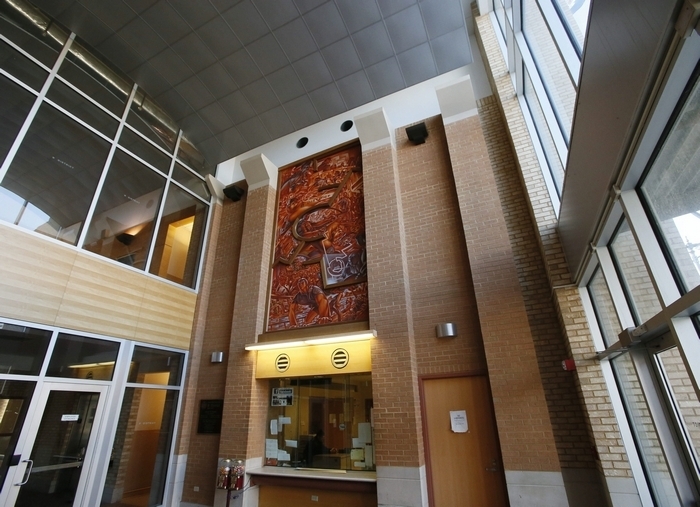 A mural rises toward the ceiling of a downtown police station. Circular stained-glass skylights and carved wooden doors greet visitors at an East Side library. These artworks exist because of a 15-year-old city law that requires public art to go up where city money is spent on major public works projects. But that law has been largely ignored since Sept. 11, 2001, when money became tight and art a luxury. “We haven’t had a serious commitment to public art since Sept. 11, when priorities changed,” said Ted Pietrzak, a member of the Buffalo Arts Commission and the previous director of the Burchfield Penney Art Center. That situation is changing as City Hall places a renewed focus on making sure that public art is included in major construction projects and that neighborhoods near those projects are asked what the art should be. “We try to make it sensible for major large projects,” said Public Works Commissioner Steven J. Stepniak. Six upcoming major public projects in Buffalo will include public art, including the return of traffic to Main Street, a makeover of the Niagara Street corridor, improvements to Allen Street and upgrades at Roosevelt Plaza downtown. “It’s been a slow process, but we really have made incredible strides,” said Buffalo Arts Commission Chairwoman Catherine Gillespie. What made possible the public art at the B District station at Main and Tupper streets and at the Frank E. Merriweather Jr. Library on Jefferson Avenue is the Art in Public Places law, which took effect Sept. 1, 1999. When the city spends $1 million or more on a capital project, the law requires that at least 1 percent of the total project cost go toward art. The goal was to support local artists and enhance public spaces, much like what occurred at Metro Rail stations, which are home to murals, paintings, photography, artistic benches and sculptures. The Art in Public Places law was ignored in recent years because of the tight money situation. But not anymore. Navigating City Hall’s maze in order to contact the right people and make them aware of the law was key to getting action, Gillespie said. Once officials at the Department of Public Works, which oversees every major capital expense, from paving roads and fixing bridges to installing new lighting, realized that the law was on the books, the Arts Commission and Stepniak have worked well together, Gillespie said. One recent project that cost more than $1 million but did not come with a public art component was the new basin and seasonal water feature in Martin Luther King Park. But new projects of more than $1 million will have artistic components. The city’s latest effort to incorporate public art is in a $2 million makeover of the Niagara Street corridor, home to a large Hispanic community. Tentative plans call for metal sculpture installations at Maryland and Jersey streets that evoke an arch and mark Niagara Street as “Avenida San Juan,” though a public vetting process is still under way. “Kudos to the Public Works Department because they did engage the community,” Pietrzak said. Subcommittees that will work with community stakeholders are in the works for every project. Hispanics United was involved in the discussion of what should be installed at Niagara Street. This practice is in contrast to one of the city’s previous attempts to adhere to the law. The controversial 12-foot “Guardian Angel” statue slated for a police station in the Ferry-Fillmore District in 2001 was never installed because of hostile public reception. No piece of art replaced it, said Council Majority Leader Demone A. Smith, who represents the Masten District. The renewed focus on adhering to the Art in Public Places law has the full support of the Common Council, which unanimously, directed the administration to follow the law. “It is a way to increase the vibrancy of the city,” said Delaware Council Member Michael J. LoCurto, who sponsored the resolution. The city’s fiscal condition is in the best shape that it’s been in since the financial crisis in 2001, and “it is time to recall the wisdom of this program,” LoCurto wrote. Looking ahead, the Arts Commission would like the city to apply the requirement to every project in the city that costs more than $1 million and where city funds are spent, even if the city isn’t leading the project. A separate provision of city law, which sets aside 1 percent of the city’s annual capital budget for conservation of the city’s collection of about 200 pieces of art, including monuments and portraits hanging in City Hall, has been followed since about 2009, Gillespie said. About a quarter-million dollars per year has been set aside for art conservation. Set to be restored soon is a 1916 statue of Commodore Oliver Hazard Perry in Front Park.